Michael Joseph Piazza (/piˈɑːtsə/; born September 4, 1968) is a former American professional baseball catcher who played 16 seasons in Major League Baseball (MLB), from 1992 to 2007. He played most notably for the New York Mets and Los Angeles Dodgers, while also having brief stints with the Florida Marlins, San Diego Padres, and Oakland Athletics. 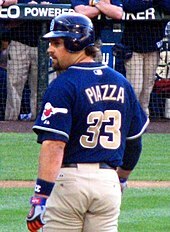 A 12-time All-Star and 10-time Silver Slugger Award winner at catcher, Piazza produced strong offensive numbers at his position; in his career, he recorded 427 home runs—a record 396 of which were hit as catcher—along with a .308 batting average and 1,335 runs batted in (RBIs). Piazza is owner of the Italian soccer team A.C. Reggiana 1919, which played for two seasons (2017–2018) in Serie C under his leadership before its non-registration due to continued financial troubles. Piazza was born in Norristown, Pennsylvania, grew up in Phoenixville, Pennsylvania, and attended Phoenixville Area High School. He is of Italian and Slovak ancestry, and is the second-oldest son of Vince and Veronica, with brothers Vince Jr., Danny, Tony, and Tommy. Mike grew up a Philadelphia Phillies fan, and admiring Hall of Fame Third baseman Mike Schmidt. Vince Piazza earned a fortune of more than $100 million in used cars and real estate, and attempted several times to purchase an MLB franchise. When the Dodgers—managed by Vince Piazza's childhood friend Tommy Lasorda, the godfather of Mike Piazza's youngest brother, Tommy—visited Philadelphia, Piazza visited the Dodger clubhouse and served as a bat boy in the dugout. Vince Piazza's own hopes of playing baseball had ended at the age of 16 when he left school to support his family. He saw that Mike Piazza had potential in the sport, and began encouraging his son to build his arm strength at the age of five. When he was 12, Piazza received personal instruction in his backyard batting cage from Ted Williams. The Hall of Famer praised his talent, advised him not to let anyone change his swing, and autographed Piazza's copy of Williams' The Science of Hitting. Vince Piazza threw hundreds of pitches nightly to his son, who shared his father's focus on baseball, clearing snow if necessary to practice his hitting and, after reaching the major leagues, practicing on Christmas Eve. He graduated from Phoenixville Area High School in 1986, after which he went to South Florida and joined the Miami Hurricanes his freshman year; receiving no playing time that season, Piazza transferred to Miami-Dade North. After his father asked Lasorda to select Piazza as a favor, the Miami-Dade Community College student was drafted by the Dodgers in the 62nd round of the 1988 MLB amateur draft as the 1,390th player picked overall. Lasorda asked Piazza to give up his first base position and learn how to catch to improve his chances of reaching the major leagues, and helped him attend a special training camp for catchers in the Dominican Republic. Piazza became an excellent hitter, especially for a catcher. His MLB debut came with the Dodgers on September 1, 1992, against the Chicago Cubs. He drew a walk in his first plate appearance and then doubled to deep center field in his first official at-bat, against Mike Harkey of the Cubs. He hit his first home run on September 12, 1992, against Steve Reed of the San Francisco Giants. He only appeared in 21 games that season, hitting .232. Piazza was involved in a bizarre incident during the 2000 World Series. Earlier in the season during interleague play, Yankees pitcher Roger Clemens hit Piazza in the head with a fastball. Piazza suffered a concussion and was forced to miss the 2000 MLB All-Star Game. Clemens was widely criticized by Mets fans for the incident, but Clemens maintained that the pitch was not intentional. Clemens and Piazza would go on to face each other again in the first inning of World Series Game 2. During the at-bat, Clemens threw a pitch that broke Piazza's bat as he fouled it off, sending the barrel and a sharp edge of the broken bat directly at Clemens on the mound just as he finished his delivery. Clemens caught the barrel, initially thinking it was the ball coming back at him, but upon realizing it wasn't the baseball, he threw it across the first base line towards the Yankees' dugout and just past Piazza who was running down to first. Piazza gave a long stare at Clemens and slowly started walking towards Clemens to confront him, and Clemens asked the umpire for a new ball as if nothing had happened. During replays, Clemens can be seen shouting "I thought it was the ball!" and asking the umpire for a new ball multiple times as the two benches cleared and met at the mound. Words were exchanged between the two players, but no punches were thrown from either team and nobody was ejected. Piazza later caught for Clemens when both were on the NL team in the 2004 All-Star Game. Clemens gave up six runs in the first inning. Piazza's game-winning 8th-inning home run in the first professional baseball game played in New York following the 9/11 attacks has been called iconic, therapeutic, and symbolic. The jersey he wore in that September 21, 2001 game was purchased in April 2016 for $365,000, the highest price ever paid for a modern-day jersey, and is displayed on a rotating basis among the 9/11 Memorial Museum, Citi Field, and the National Baseball Hall of Fame. On July 25, 2007, in the top of the ninth inning in a game between the Angels and Athletics at Angel Stadium, a fan threw a water bottle that hit Piazza, who had homered earlier in the game. Piazza then pointed his bat in the stands at the fan he believed threw the water bottle to get the attention of security. The fan, who was identified as Roland Flores from La Puente, California, was arrested by the ballpark security. Piazza pressed charges against Flores. Flores was sentenced to 30 days in jail and three years of probation on March 27, 2008. On September 26 against the Boston Red Sox at Fenway Park, Piazza hit his 427th and what would be his final major league home run of his career off of rookie pitcher Jon Lester. In 2016, Piazza purchased a majority ownership stake of the third-division Italian soccer club A.C. Reggiana in Reggio Emilia, with an estimated investment of $3 million. His interest grew from his friendship with former Italian soccer player Mauricio Franzone. However, after two seasons of ownership and a controversial playoff loss to Robur Siena (with a penalty called in the 96th minute) Piazza put the team up for sale. Finding no buyers, and faced with mounting costs, including rent, the club ceased operations in July 2018. In December the team declared bankruptcy for the third time in the last twenty years. Piazza's autobiography, entitled Long Shot, was released in February 2013. On February 3, 2007, Piazza's wife gave birth to the couple's first child, daughter Nicoletta. On August 3, 2009, their second child, daughter Paulina, was born. The couple's third child and first son, Marco, was born in July 2013. Piazza is a devout Roman Catholic. His faith was instilled in him by his Catholic father and was featured in Champions of Faith, a DVD documentary exploring the intersection of Catholic religious faith and sports. He also appeared in the follow-up video Champions of Faith: Bases of Life. He was represented his entire career by sports agent Dan Lozano. In his retirement, his marketing is being handled by Octagon (Sports Agency). Piazza has lived in Miami since 2002. ^ "Known for big bat, Piazza was underrated defensively". MLB.com. Retrieved July 21, 2016.